Many diverse individuals may not have previously been considered mainstream within organizational career development strategies (Avery, 2011). The objectives of this chapter are to 1) introduce the idea of leveraging diversity through a career development paradigm shift and 2) to offer researchers ways to further explore this shift in thinking and enhance organizational and individual career development strategies. The suggestion is not for organizational leaders to choose diverse employees over others, but that they acknowledge and understand all employees and use that knowledge to enhance and improve organizational performance. To accomplish organizational success through career development, they must acknowledge the value of all employees. For the heart to thrive it must be nourished (Lawler, 2003) and if organizations believe that people are the heart of the organization’s existence, the process and practice of career development is one way for organizations to provide proper nourishment to employees in the workplace. The bottom-line performance of organizations is affected by having the right people in the right jobs, doing the right things at the right time. Choosing the most suitable career development strategy that is appropriate for both the organization and the individuals impacting the bottom-line performance is vital. Organizations and individuals must understand career development strategies because expectations, goals, and/or aspirations are essential to the successful execution of the strategy. Some organizations make the mistake of establishing career development strategies built on the lofty premise of “if we build it, they will come” as there is no guarantee that “they” will come. Instead, this effort requires active analysis and involvement by all stakeholders helping to ensure the appropriateness and allocation of resources. There is no absolute right choice, but there should be an attempt to achieve a return on investment from a human capital and financial perspective. Generally, younger employees are sometimes more eager than senior staff members for career development. However, in this fast-paced economic environment, all employees need to be current in all areas of their development. This condition mandates and establishes a mind-set of system-wide application, flexibility, and the selection of relevant organizational talent management and career development strategies. A pattern of work-related experiences that encompass the course of a person’s work life is one description of a career and obtaining the most suitable and applicable career development is crucial if the individual seeks a successful, long-term career. Individuals are expected to own and held responsible for their personal career development. In today’s global economy, this expectation of career ownership and responsibility represents a tremendous adjustment for some workers especially when the previous situation only required them to show up for work as scheduled, exhibit appropriate workplace conduct, and follow the documented script of instructions to meet performance goals. Yet, with the advancement of technology and the explosion of the information-powered workplaces, the speed of change has forced individuals and organizations to change and adapt rather quickly. Understanding the career progression process and the potential benefits for both the individual and the organization is a key to success for all involved. No one individual worker is the same. This acknowledgement of the differences necessitates finding a “fit” between organizational and individual goals if one adheres to Boudreaux’s (2001) description of career development as focusing “on the alignment of individual subjective career aspects and the more objective career aspects of the organizations in order to achieve the best fit between individual and organizational needs as well as personal characteristics and career roles” (p. 806). In the end, the individual benefits through understanding what it takes to carve out a career that aligns with their diverse Knowledge, Skills, and Abilities (KSAs). Career development is considered to be one of the three pillars of Human Resource Development (HRD) (Chalofsky, 1992; Swanson, 2001) and “organizational career development theories should focus the interaction between individual and organization, and can also be regarded as change theories on an individual level, which make them central to HRD” (Swanson & Holton, 2001; van Dijk, 2004, p. 772). The organization also benefits from dedicated employees who want to stay and build a career with the organization. These employees include many diverse individuals who have not been previously considered mainstream within organizational career development strategies (Avery, 2011). One means of building a solid interaction between the individual and the organization’s career development is leveraging and promoting workplace diversity. 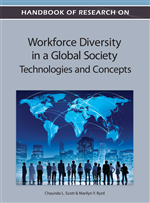 Career development has not been examined to the extent possible with regards to developing and leveraging workforce diversity across all levels of the organization. The objectives of this chapter are to 1) introduce the idea of leveraging diversity through a career development paradigm shift and 2) to offer researcher ways to can further explore this shift in thinking and enhance organizational and individual career development strategies. Human Resource Development (HRD): The study and practice of increasing the learning capacity of individuals, groups, collectives, and organizations through the development and application of learning-based interventions for the purpose of optimizing human and organizational growth and effectiveness. Career Development: A pillar of HRD, focuses on the alignment of individual subjective career aspects and the more objective career aspects of the organization in order to achieve the best fit between individual and organizational needs as well as personal characteristics and career roles. Essentially, it is the process of assessing current career reality and determining the appropriate means of changing or progressing along a career path through the acquisition, retention, and transference of relevant Knowledge, Skills, and Abilities (KSAs). Human Capital: An economic concept emphasizing the abilities and skills of any individual, especially those acquired through investment in education and training, and that fundamentally enhance potential earning of income. Workplace Diversity: A focus on the ways that individuals differ that can affect a task or relationship within an organization. An understanding of the varied approaches that members of different identity groups bring to the workplace to include perspectives on discrimination and fairness, access and legitimacy, and learning and effectiveness. Employee Location Value: The value an organization may gain from employees, established by their placement within the career development and organizational hierarchy or structure. A concept that takes into account both the internal and external location value of the employee to the organization in the consideration of career development experiences and opportunities to leverage workplace diversity across multiple organization levels. Career Path: The process of guiding and developing employees’ work experiences and positions within jobs that build career knowledge. It is a major life accomplishment that revolves around work, provides a sense of purpose, challenge, self-fulfillment, and a source of income. Career Capital: A resource based view of “knowing how” to acquire career relevant skills and work-related knowledge, “knowing why” or what energizes, provides a sense of purpose, motivates, and allows an individual to identify with work, and “knowing whom” to build interpersonal relationships, organizational partnerships, and social alliance with to access information and forge channels for self-promotion in the workplace.